The apartment was as other guests have shared. Beautiful views of the sea and the outdoor spaces were perfect for morning coffee and evening meals and wine. Being so close to the Center was a plus for us as it provided perfect "people watching." As mentioned the trains are nearby and active, however we were not bothered by them and we felt as though they added to the ambiance. Lisa met us and walked us through the apartment and even provided wonderful regional wine and snacks. The apartment itself is quaint and comfortable. Luisa was a wonderful hostess. She met us on our arrival and helped us with our baggage on the stairway to the apt. She was immediately responsive to any and all requests. The apt was lovely with an amazing view of the water. We enjoyed sitting on the lanai soaking up that view and watching the activity below the apt. So many good restaurants and nice shops in Monterosso al Mare. Thank you, Luisa, for a wonderful stay in Cinque Terre. Also for the treats you provided for us. We so enjoyed meeting you. Our host was wonderful and very attentive. We asked for a fan one day and she provided one to us promptly. The neighborhood is very family friendly. Only things to consider are that it is right next to the train tracks and the trains run all hours of the night. We had to keep our windows open since there is no AC and with that, came a ton of noise. The pull out couch was slightly uncomfortable, but was attached to a beautiful balcony! Overall the stay was great and being centrally located was great. We loved our stay in Monterosso. This apartment is in a perfect location in the Old Town. It overlooks the beach and the piazza down below. It's wonderful to sit out in the evening and watch the locals young and old enjoying the playground and public squares. Monterosso has flat areas to walk around town and the best beaches to sit and sun. The other Cinque Terre towns are very steep, with little or no sandy beach. This apartment is two story, with the kitchen on top. You walk up 30 steep stairs to access the front door. Everything was nice and clean. Luisa was very welcoming and left us thoughtful treats. The sofa bed was a bit lumpy for an adult. I will recommend this apartment to my friends coming to this area. The host of this home is so kind, helpful and truly cares about your experience. The apartment is in a perfect location, central to everything in the village and a short walk to the train and beach. I hope we can visit again! My husband and I recently stayed in Monterosso and loved it! We had to make some last minute changes to our travel plans and Luisa was very accommodating in allowing us to check in a day earlier. Fabulous location, very close walking distance to the train station, beaches, restaurants, hiking trail and port. The view from both balconies is amazing. It was our favourite spot to drink some wine and eat our paninis that we had made at the supermarket just down the street. Water pressure in the shower was great. Had 2 beds pushed together but comfortable. Playground right outside in the piazza where kids would play until midnight and trains frequently passing by. Voices and sound definitely echo so earplugs would be of benefit for light sleepers, otherwise you get used to it. The two flights of stairs to access the apartment are quite steep and slippery so just be very careful. Wi-Fi connection was good. Luisa left some recommendations of places to see and do which were helpful. 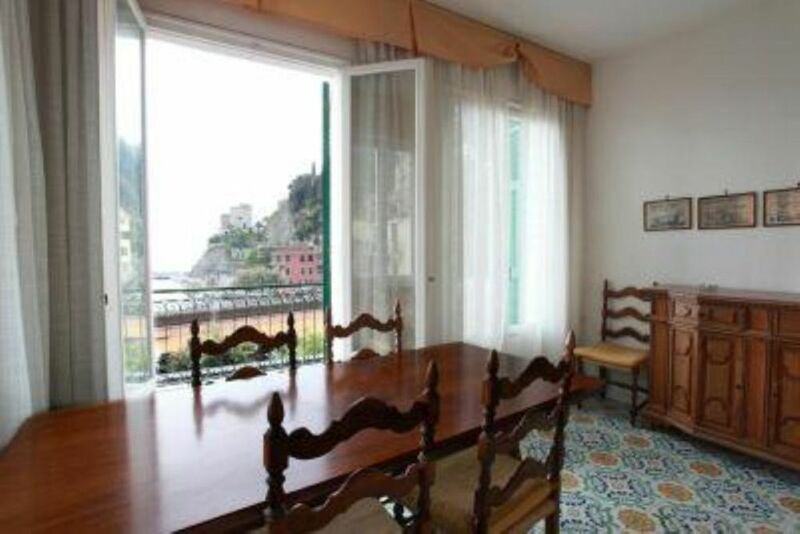 We would recommend Luisa and her apartment for your stay in Monterosso.